Hugo Chávez is visiting Doha, along with 11 other South American leaders, who, and 22 leaders of the Arab League seek to find common ground ahead of the G20 summit that starts on Thursday. While the Doha meeting is held in Qatar, Saudi Arabia is the only Arab League country that will be present at the G20. As he has previously stated, Brazilian President Luiz Inacio Lula da Silva is pushing for the reform of international organizations. Chile's Michelle Bachelet called for the Arab and South American nations to show that "we are walking together." Hugo Chávez called for "the final fall of the American empire," as he usually does. 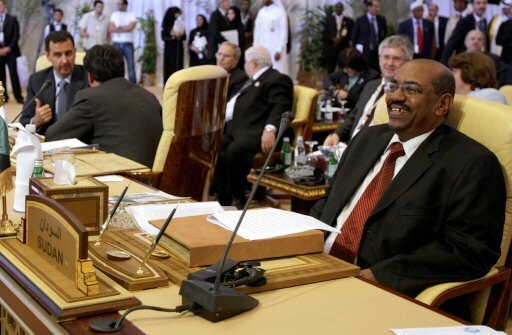 "Today I talked to al-Bashir and I asked him what risks does he run when he travels around here. I invited him to Caracas but told him, 'I hope you don't have any problems over there'." His speech, which was the only speech applauded before it started, also called for the ICC to prosecute former U.S. President George W. Bush and Israeli President Shimon Peres. I played the audio of Chávez speech in Spanish and translated it to English during my morning podcast. You can listen to it here.